The electronic stethoscope is battery powered and easy to use. 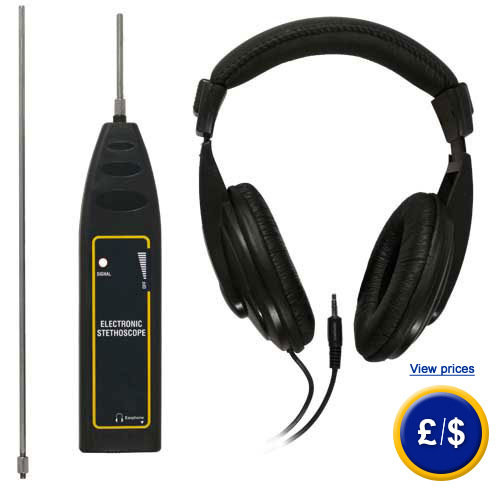 This electronic stethoscope can be used for detecting noise in machine components, such as gears, valves, vents and pumps. The person responsible for the maintenance gets the possibility to recognize sources of error before a machine or installation failure can occur, due to the excellent noise and vibration monitoring of the electronic stethoscope. The enclosure of the stethoscope is made of ABS plastic which is comfortable to hold and operate. The device uses a piezoelectric transducer which can detect very low resonant noises. 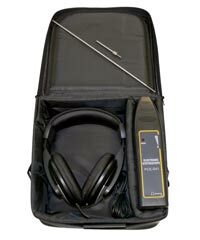 The earpiece is equipped with an adjustable headset that has 2 m cable. 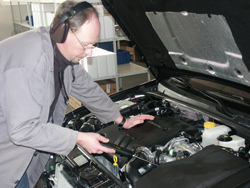 We have a similar stethoscope PCE-VT 2600 that allows to measure vibration velocity, oscillation and acceleration. This link shows an overview of all the available stethoscopes which will meet your needs.